No Fenders -Formula 1, IndyCar and A Whole lot more..: Sauber takes a Flyer on De Silvestro! Awoke to the news Friday morning that Sauber F1 has signed Indy Cars "Symona-Symona," (Simona de Silvestro) who I've had the pleasure of meeting in the flesh at Mother Speedway in 2012, when she was gamely soldiering on with the woefully inadequate 'Loti lump! 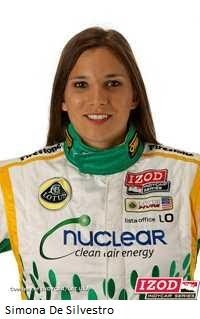 Thus Sauber F1 has hired the 25yr old "Swiss Missile" as an Affiliated member of its racing team with the plans being to groom de Silvestro for a possible race seat in Formula 1 for 2015. As this is great news for F1 in general, although it sounds like Sauber has written a new chapter in its long history and perhaps the Sergey Sirotkin experiment is over? Can women be competitive in F1?